Built at the end of the last ice age around 9600 BCE, Göbekli Tepe in southeast Turkey was designed to align with the constellation of the celestial swan, Cygnus—a fact confirmed by the discovery at the site of a tiny bone plaque carved with the three key stars of Cygnus. Remarkably, the three main pyramids at Giza in Egypt, including the Great Pyramid, align with the same three stars. But where did this ancient veneration of Cygnus come from? Showing that Cygnus was once seen as a portal to the sky-world, Andrew Collins reveals how, at both sites, the attention toward this star group is linked with sound acoustics and the use of musical intervals “discovered” thousands of years later by the Greek mathematician Pythagoras. Collins traces these ideas as well as early advances in human technology and cosmology back to the Altai-Baikal region of Russian Siberia, where the cult of the swan flourished as much as 20,000 years ago. He shows how these concepts, including a complex numeric system based on long-term eclipse cycles, are derived from an extinct human population known as the Denisovans. Not only were they of exceptional size—the ancient giants of myth—but archaeological discoveries show that this previously unrecognized human population achieved an advanced level of culture, including the use of high-speed drilling techniques and the creation of musical instruments. The author explains how the stars of Cygnus coincided with the turning point of the heavens at the moment the Denisovan legacy was handed to the first human societies in southern Siberia 45,000 years ago, catalyzing beliefs in swan ancestry and an understanding of Cygnus as the source of cosmic creation. It also led to powerful ideas involving the Milky Way’s Dark Rift, viewed as the Path of Souls and the sky-road shamans travel to reach the sky-world. Includes a 16-page color section. In Stock! 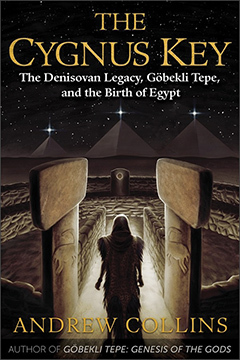 THE CYGNUS KEY: The Denisovan Legacy, Göbekli Tepe, and the Birth of Egypt By Andrew Collins. 464 Pages. 6x9 Paperback. Illustrated. Bibliography.